Lovely Awkward: A Year of Wine, Romance and Life Among the French: Heads in a pot -- and we ate them! Heads in a pot -- and we ate them! 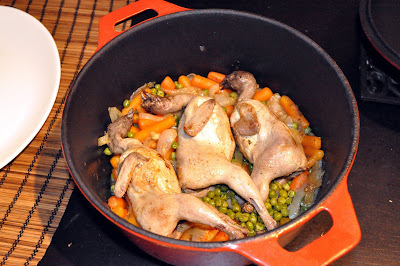 The other day, the Professor cooked a French specialty for dinner. At first, what he'd made completely freaked me out. But, in the end, it tasted delicious. The birds are called les cailles and when the Prof opened the pot to present his hard work, I was shocked to see that they still had their heads! Yes, I'm a baby when it comes to haute cuisine: As somewhat of a vegetarian, eating in France has been interesting. I've been trying to experience all of the tastes and flavours around me, but my sense of adventure has had to evolve. I'm not even sure why I'm vegetarian-ish anymore -- I just am and I've been that way since I was 14 or 15. Before moving here, I'd never even considered that I'd change. In Canada, being vegetarian-ish has become part of the culture ... at least, this is how I've learned to describe myself to the French. Here in Nice, the only other vegetarian I've met is another Canadian. The French just aren't used to that kind of picky eater. And thus, I've had a few experiences thrown at me here that I would never even have encountered at home. I'll admit that for the sake of cultural curiosity, I've been experimenting (mind you, a very, very little): In Paris, I tried a piece of saucisson and earlier in Nice, I tried a morsel of thinly sliced Corsican ham as well as one miniature bite of rabbit. No frogs' legs yet -- but no one sitting near me has ordered them. I mostly try these experiments off of other people's plates. As for the cailles, however: To assuage my guilt for eating the headed birds, I offer this picture of living cailles, lovingly raised by school children. Although, if you read French, you might notice that the birds went away during the students' vacation to live in a place where they could run freely. I'm not sure what that means in France, but I know what it means in Canada.